My friend was going to take their photo, but I dissuaded her. 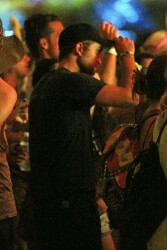 It’s weird, but I feel oddly protective of Robert Pattinson. I’ve met him and think he’s a genuinely nice guy; the last thing I wanted to do was make him feel uncomfortable or draw attention to them. These kids seem like a normal young couple who rarely get to do normal things, and I didn’t want to ruin their moment. They were wandering around the general population unnoticed, and I was reluctant to invade their privacy (more so than I already have). 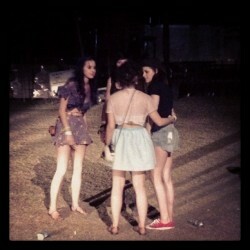 Still, I shot off a quick generic tweet just to tell my friends that I saw them. There were a couple of really sweet tweets, however, mostly praising an interview I did with him way back in 2008 (twihards have long memories). And the messages about how I was lying were outnumbered by the messages demanding every. single. detail. What were they wearing? 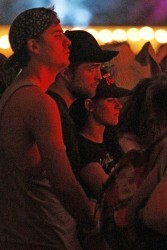 Did they look loving? 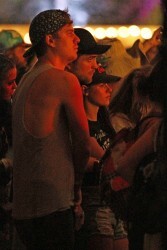 Has his hair grown out or will he need a wig for the Breaking Dawn reshoots? Have I ever seen another couple so epically soul-matey? I’d love to tell you all that I watched him throw her down on the grass and make love to her before a unicorn appeared to whisk them into the clouds, but they were just a normal looking couple surrounded by their normal looking friends, eager to see Radiohead like the rest of us. Radiohead was awesome, btw. So were M83, St Vincent, Girl Talk, The Hives, SBTRKT, The Rapture, Gary Clark Jr, tUnE-yArDs, Santigold and Childish Gambino. But you don’t care about that, do you? 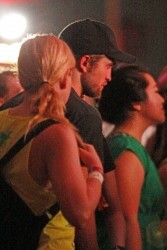 You just want to hear about how she rested her hand on his chest (which she did) and how he took her hand and led her through the crowd to the VIP section (which he did). 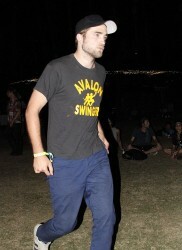 GossipCenter Drawing an end to what was quite the weekend, Robert Pattinson and Kristen Stewart were spotted trekking through the crowds at the 2012 Coachella Valley Music and Arts Festival in Indio, California on Sunday night (April 22). 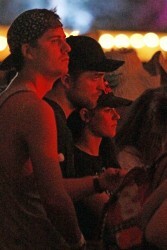 As for Coachellla's second weekend closing lineup, Rob and Kristen were treated to performances by acts including Florence + the Machine, The Hives, At The Drive-In and a night-capping effort by Dr. Dre and Snoop Dogg. 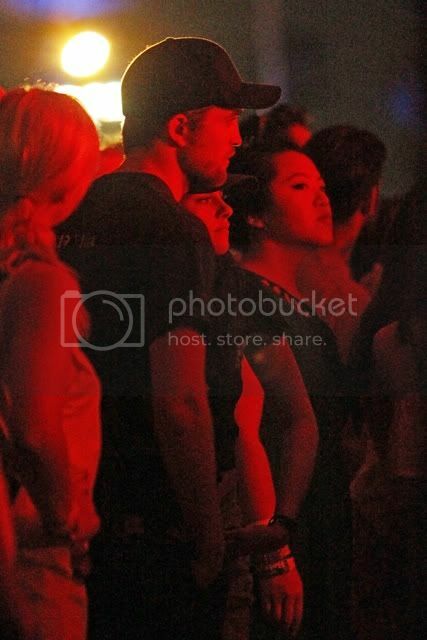 Having been situated at the annual outdoor celebration for the past few days, Pattinson and Stewart reportedly had quite the romantic moment on Saturday night. 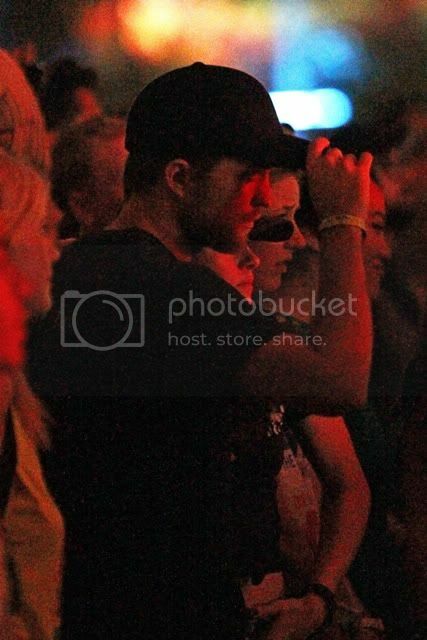 Joined by a few friends, the "Breaking Dawn" co-stars were side-by-side at the Empire Polo Club venue, but quickly split apart from one another upon a paparazzo's arrival. 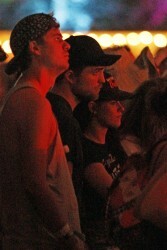 heatherldupreyJust stood next to Kristin Stewart, Rob Pattinson and Katy Perry and watched Beirut! 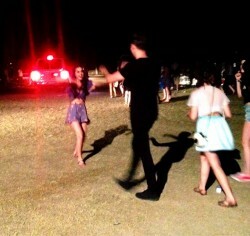 Coachella is magical.